Last year August when I stayed on the small island of Koh Hae, near Phuket I had to urgently send an official document with proof of identity to the US. This included a form which had been sent to me in Adobe PDF format and had to be filled out. If you're not in a situation to be physically present, you will normally; (print and) fill out the form or document and sign it, together with a copy of your passport and send it by post or by fax. 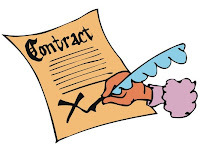 Although some companies will accept (PDF) documents sent by email, most companies will consider a document or contract legitimate if it is send by post or by fax only, which is technically spoken a bit outdated. When inquiring at the reception of the only hotel on the island, it seemed that their scanner/printer/copier was broken. Their fax machine was kind of working but in bad shape. So I first though I had no other option than to wait for the next day and go to the mainland to find an internet café and copy/fax service, taking the risk that something went wrong or was not filled out properly and had to resend it the day after. After taking a little rest I came to the following paperless solution, which will intitially take more effort, but is quite easy to reproduce in other similar situations as well. 1. Make photo's of your passport/ID and your signature written on a blank piece of paper and upload it to your PC. 2. Edit the signature by clipping the photo (unless you have a macro camera). 3. If you're able, mark the white background as transparent and save the file as a transparent gif image, since this will show your signature on top of any background details on the original form instead of residing in a white box. 4. Download the PDF form. 5. Convert the PDF form to text editor format, in my case .DOCX (Word 7), this can be done online using pdftoword. 6. Fill in all details with your text editor and import the signature gif-file at the proper place in the document. If necesarry adjust the scale, because usually it will be too large. 7. Import your own documents and/or fax header page into new pages of the document. 8. Import the copy of your passport/ID image on a new page in oder to make the whole one document. 9. Save the file in a popular format like .DOC, .DOCX or .PDF. 10. Upload the document to a fax service like Faxzero which provides their services online, or for non-US destinations, use one of these four alernatives.